There are documentaries about science fiction. There are documentaries about Japanese animation. There are documentaries about the history of anime fandom. All are entertaining and educational. Yet I can't imagine why anyone would want to watch a documentary on contemporary anime fans. Luckily, this unholy union of video tape and modern fandom is only a brief slice of Otaku Unite, which for the most part, is one of the most informative things on the stateside growth of anime that a newly inducted fan could ever watch. Presented by Movies of My Dreams Productions and directed by Eric Bresler, Otaku Unite is a seventy minute documentary on American anime fandom, and the genre from whence it sprang. First debuted at Anime Weekend Atlanta last September, it's since gained a sort of grassroots popularity in the convention scene, and will be screened in several more conventions this year. If you're dying to see this thing, so far your only hope is to catch it at an upcoming convention, but never you fear. If it's a documentary on the throes of fandom you want, plans are in the air about releasing this on DVD sometime soon. The video gets off on a rocky start with an un-introduced glimpse into the fan-supported phenomenon of Kaiju Big Battel. It's an effective way to advertise the American-made WWF-styled sentai fighting slap fest, but with no introduction to this segment and an abrupt cut into the actual documentary, it feels like someone accidentally taped over the video with a home movie. Truthfully, such a complaint can only be nitpicking though, as the main focus of Otaku Unite is certainly not the sentai ad at the beginning. The actual documentary has its ups and downs, but if ever there was a proper way to initiate new anime fans, it would be to paddle their rears with Otaku Unite. Covering everything from the history of anime in the US, the birth and growth of the American anime industry, and of course, the fans that love this artistic medium, this provides the perfect crash course in this unique aspect of our popular culture. In a video titled Otaku Unite, it's natural that the first thing to do is to define the word “otaku.” Interviewing a variety of people from everyday fans to industry personnel, it's interesting to see the different viewpoints on what “otaku” really means. While older, more knowledgeable fans acknowledge that the word's negative connotations and true meanings, they are wise enough to point out how anime fans tend to put a positive spin on the word. The point is proven clearly in the interviews with random convention attendees who proudly glorify what is means to be an otaku. The variegated takes on all the subjects brought up is really the strength of this documentary. Rather than just taking a topic and vomiting up information about it, it shows the difference in opinion that people will have about it. For a group of people as unique and individual as anime fans, this is key to seeing just how multifaceted the members of this fan base are. It is a bit odd why only a small handful of convention goers were selected to share their views and not more people, but the end result works out just fine. Staggering their thoughts with industry members and anime academics, the documentary also includes commentary by personalities like Jan Scott Frazier, Gilles Poitras, Helen McCarthy, and Corrine Orr. And then there are people like Jonathan Cook. Who could forget Jonathan Cook? If anyone could conjure up a mental image of an anime fanboy, there would be a 90% chance that their description would fit Mr. Cook, a DJ for his community college radio station who goes by the name of Jonny Otaku. An anime fan aspiring to be a voice actor with his slim range of uninspiring voices, he is the kind of person you see haunting the halls of anime conventions. Conceited and annoying, he provides unintentional humor in Otaku Unite with his pipe dreams and wails of how cosplay contests are rigged. This was another interesting aspect of the video. Rather than try to glorify anime fans and lift them to ungodly heights, the people that they showcase are generally the oddest of the odd, and the more “interesting” people you see in fandom. Almost all of the fans you see in Otaku Unite are the people you laugh at with your friends during the costume contest. Because of that, it's almost magical in a way that only a documentary on anime fans can be. With blatant disregard to what people think of them, and no matter how many fingers may point at their antics and/or bellies, this is the true spirit of the American anime fan. Whether this was an intentional part of the direction process or not, it works very well. After all, you just can't show the zestful passion that some anime fans carry about their hobbies if you can't show men prancing around with skirts. Aside from these snapshots into the lives of anime fans, the video also covered some of the big points in US anime history. Among them was the history of anime on US television, like Speed Racer and Robotech. The latter was given a more in-depth look and does a good job of showing the branching point of many anime fans and the reactionary nature of the beast—should anime be edited and altered so that it is more accessible to new fans, or should it be escape as unscathed as possible so it can always remain underground? These first signs of the mainstream vs. cult argument are told as is by the famed and revered/reviled Carl Macek. For people that know nothing about the turmoil and fan controversy that surrounds Robotech, this video once again provides the initiation paddle. This quickly transitions into the fandom and how it found its origins. People old enough to remember the rise of anime clubs like the C/FO will find some nostalgia in this, as well as the first anime conventions to rise more than a decade later. It is in this niche that the documentary spends the rest of its time. From convention romances like the marriage between Robert DeJesus and convention goer Emily Brown, to the two-headed snake of life and death that is cosplay, it dives into every aspect of convention life. Since this was made to be shown at a convention anyway, it seems rather pointless to watch a video in a convention about a convention, but the topic is able to trebuchet onto other things. Like Steve Bennett. Conventions wouldn't be the same without Steve Bennett. No surprise here that there's even a brief presentation on Bennett alone, the convention personality to top all personalities. Even though the video was recently made, it already feels dated. All of the video clips it uses are largely from old-school shows and all the mentions of anime that are made are from the more popular series like Sailor Moon and Ranma ½. Still, with something growing as rapidly as anime is in the US, it comes as no shock that anything would be become outdated so fast. Even so, it's surprising to know that this was premiered in 2003, as it feels at least a few years older. As much of the footage was shot a few years ago, this is probably to be expected, but it just leaves a rather musty taste in one's mouth afterwards. 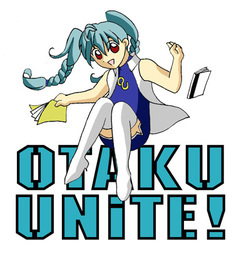 For all the topics that it covers, Otaku Unite is a great introduction to anime in the US. Educational and attention-grabbing in the way that it presents its subjects, it still carries an air of lameness that is expected to be found in a documentary about anime fans. This doesn't discount the fact that it's still a fascinating look into this genre that we've all taken interest in, and the community of fellow fans that surrounds us. So if you ever want to know what you've managed to get yourself into, check this out at the next convention you go to. You just might learn something.